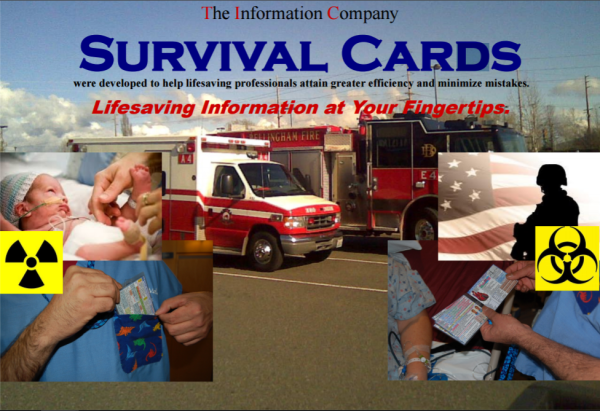 Life-Saving Information at your fingertips!!! 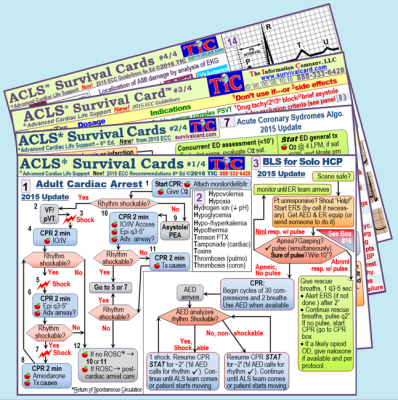 Quick reference and review of ACLS (advanced cardiac life support). 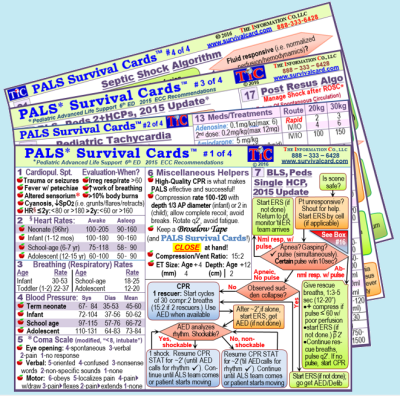 algorithms using AHA 2015 guidelines, resuscitation medications on laminated, 3 in x 5 in or pocket sized cards. 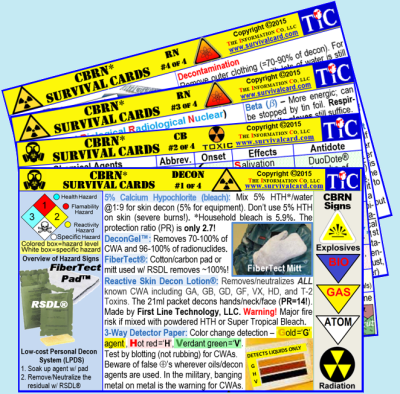 CBRN (chemical, biological, radiological, and nuclear) MASCAL information in quick reference and review format on laminated, 3 in x 5 in, pocket sized cards. 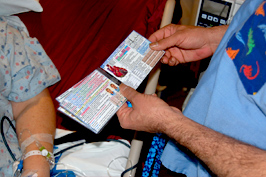 CBRN Survival Cards cover detection and treatment of VX, sarin, small pox, anthrax, and radiation. 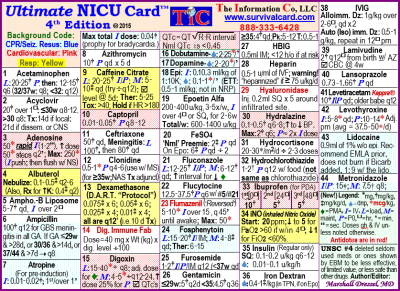 The NICU Survival Card Is quick reference and review for the most commonly used NICU medications, UVC placement information, TPN information, bilirubin graphs for term and preterm babies on pocket sized, laminated cards. This is the 5th edition of this valuable review and references card for commonly used meds for children, the dosages, and warning. It is usually updated every three years; so, is overdue! Look to see the 6th edition by Christmas time. It's a must for residents and very handy for clinical pediatricians as well. Price: $8.95 - Press the "Pediatrics" button. 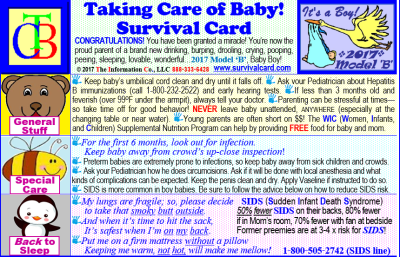 Purchase Survival Cards risk free! ​Press 'Contact Us' Button to see 'News' and to see 'Discounts'! *Modern electronics have changed our lives but sometimes can leave us "high and dry!" Case in point, many millions of people were without power, cable, or cell towers just this past winter after ice storms rendered them all to rubbish. Hospital back-up generators won't help an EMT working by flashlight or a nurse at an accident site in Paradise, MT (forget about signals there!)? That's why "low tech" can be a God-send! Imagine someone in a plane with chest pain. The AED reads the rhythm and the 17 rhythm strips on your 4th ACLS Survival Card tells you its NSR! You can reassure patient and family that it's not a heart attack! The same for first responders..."Am I witnessing a MASCAL event?" 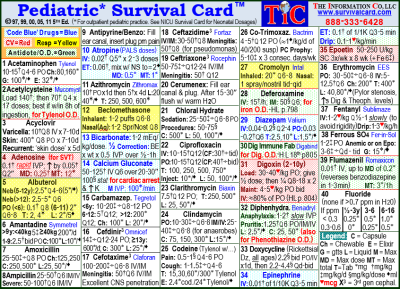 Your set of CBRN Survival Cards say "Yes, it is a chemical MASCAL and what to do about it! And think of the EMTs who are "it" for resuscitating a home-delivererd, depressed baby. 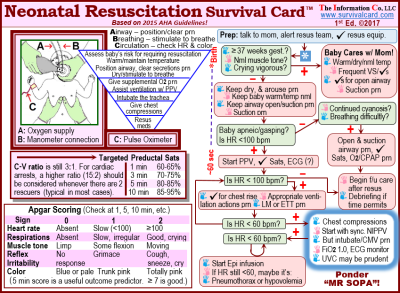 Our Neonatal Resuscitation Survival Card will guide them with what the AHA has determined is the best way to do it!